These tempting dishes are bold, innovative, fresh, easy and above all delicious. They reflect this chef’s expertise and complex palate, yet each recipe is both easy and good. Both vegans and non-vegans will find them absolutely delicious. The recipes are vast and varied and use the ingredients typically found in a vegan’s kitchen or pantry. Douglas McNish starts with “Vegan Basics” featuring 20 recipes for dishes most popular in vegan cuisine like Whipped Non-Dairy Butter, Mayonnaise, Curry Paste, Vegetable Stock and pie crust. 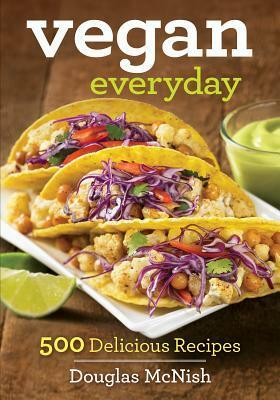 Vegan Everyday is a delicious cookbook for vegans everywhere! While I am not vegan, I eat vegetarian at least twice a week so this is a great cookbook for me. One of the things we eat a lot of is tofu and this cookbook has a ton of great tofu recipes. The cookbook starts with an introduction and everything you need for a vegan and gluten free pantry. It then goes into breakfasts, appetizers, snacks, pasta, stir fry, soups, baked goods, and desserts. Each section is filled with recipes and then there are several large color photos of some of the recipes. 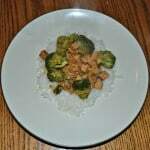 Many of the recipes are easy to prepare and can be cooked in under 30 minutes. Some of the recipes I can’t wait to try are Chocolate Hazelnut Milk, Singapore Summer Rolls, Mediterranean Bean Salad, Spicy Angel Hair Toss, Pecan Pie, and even Grasshopper Pie. 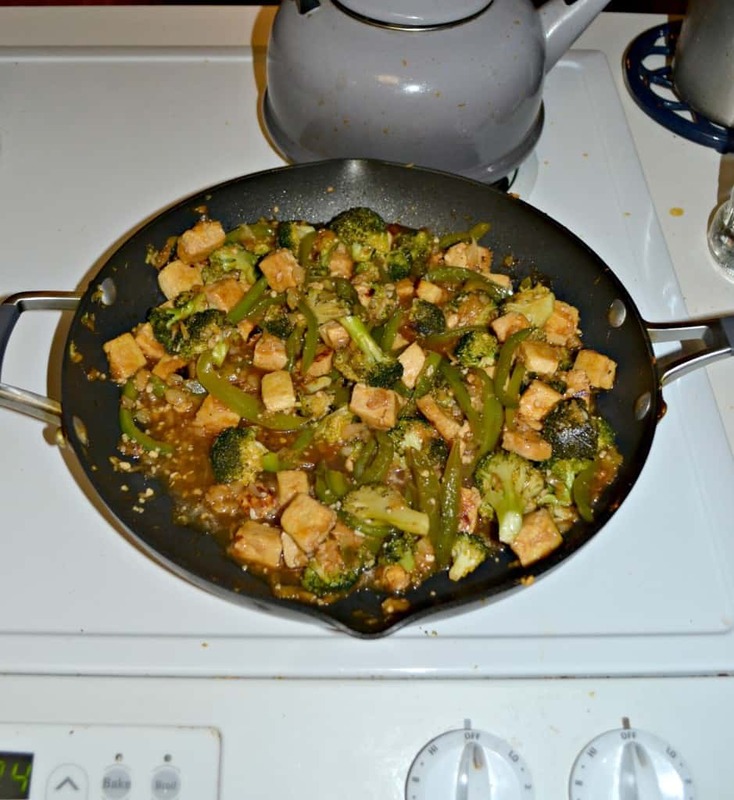 The recipe I wanted to try first was the Sweet and Sour Tofu Stir Fry Recipe. 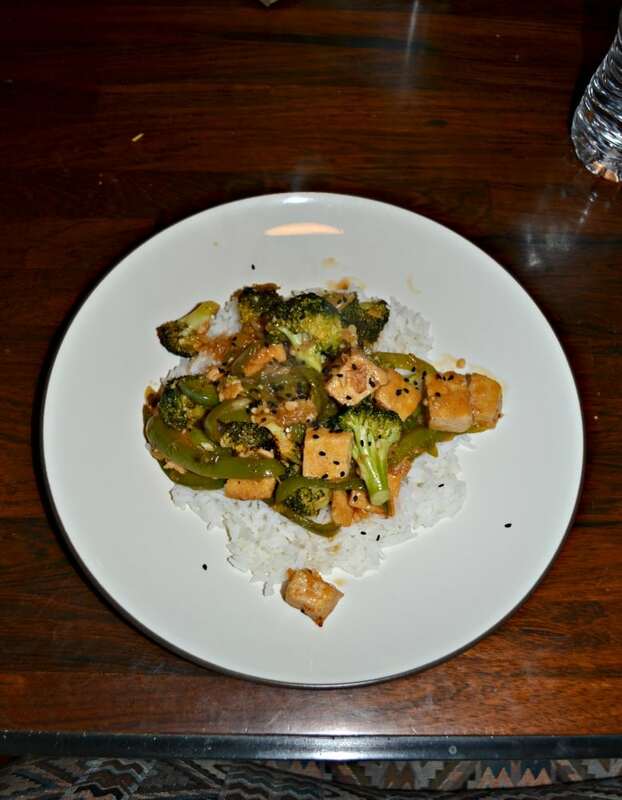 I love tofu in stir fries and knew this would be a great recipe. It takes less then 20 minutes to prepare and is really flavorful. 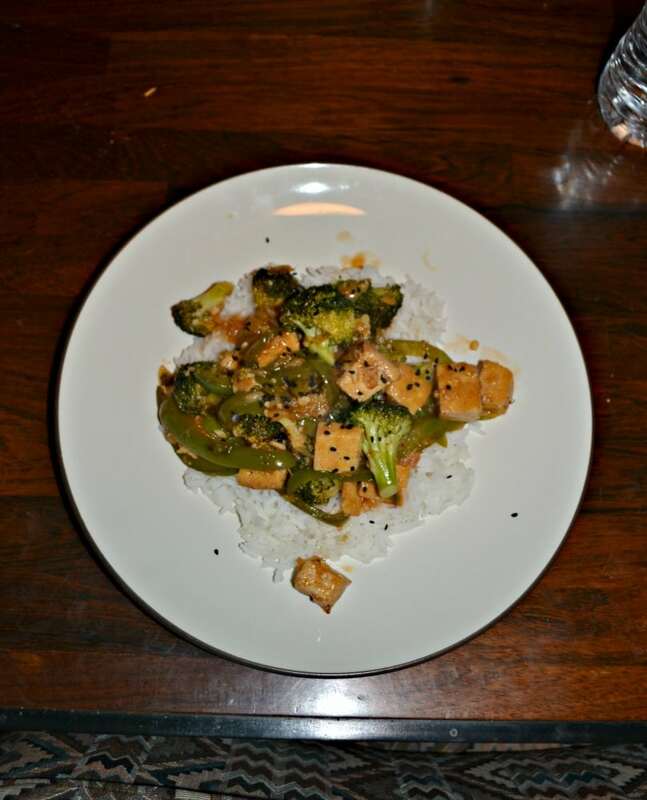 It has tofu, red peppers, broccoli, and pineapple with a delicious sweet and sour sauce. 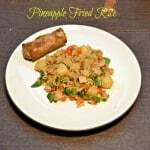 I served the dish over top of rice and with an eggroll. 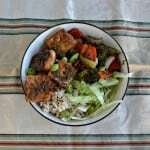 It was the perfect vegan weeknight meal. 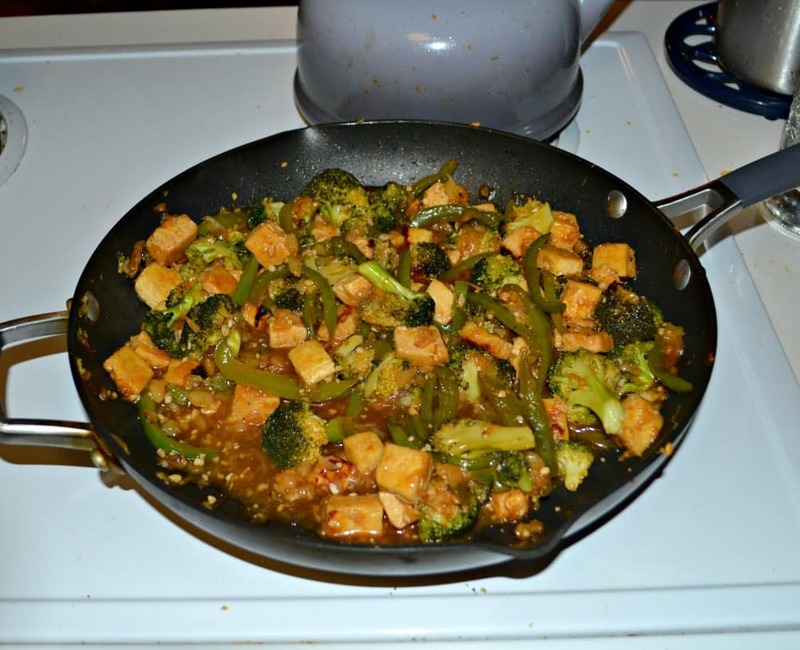 A delicious sweet and sour sauce on top of tofu and vegetables for a quick and tasty weeknight meal. 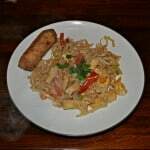 To make the sweet and sour sauce whisk together all of the sauce ingredients in a small saucepan over medium high heat. Bring to a boil then reduce heat and simmer, stirring constantly, for 2 minutes or until thickened. Remove from heat. In a large skillet over high heat, heat oil. 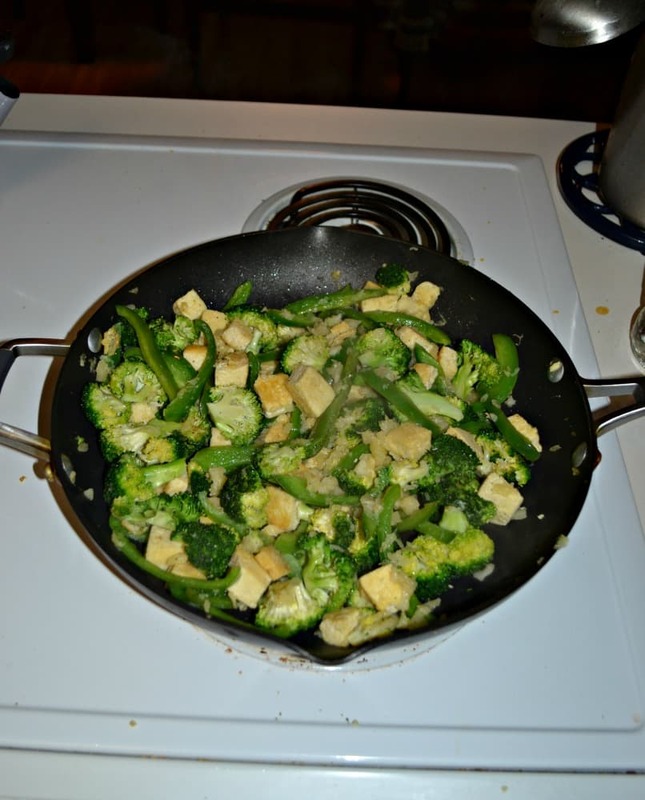 Add tofu and cook, stirring frequently, until golden brown on all sides, 8 to 10 minutes. Add red pepper, broccoli and pineapple; cook, stirring frequently, for 3 to 4 minutes, until pepper and broccoli are tender. Add sweet and sour sauce and stir to combine. Serve immediately over rice if desired.